Women's removable pad tankini top swimsuits,white and black AOP fabric with pink piping decorated at the edge of cup. Black ladies tankini swimwear,wavy stripes composed with white dots feature womens swimsuit tops. Purple ladies tankni top and bottoms,soft and comfortable fabric,Quick drying. Women's tankini beach wear,beautiful patterns,with top and bottoms. Blue white stripes halter women's tankini swear,stylish and suitable for young ladies. 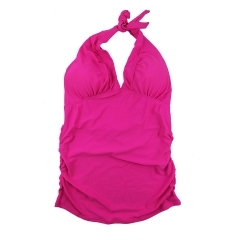 Solid ladies halter Tankini swimming suit tops with removable cups.